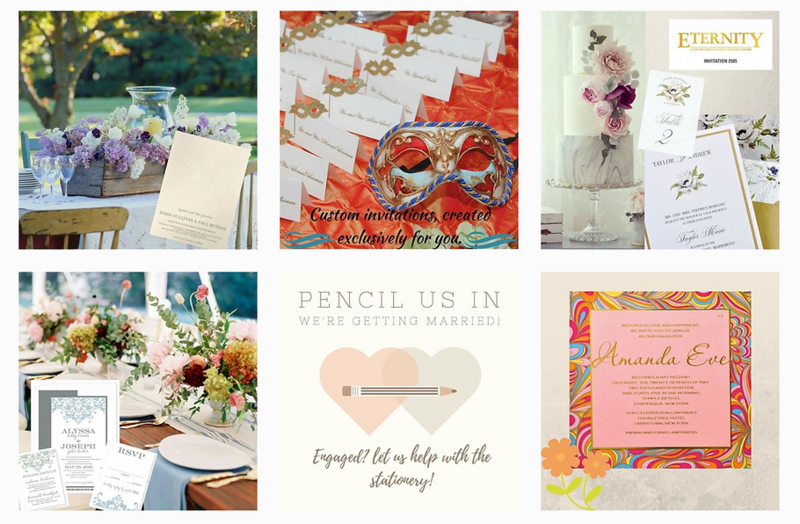 As we discussed in my latest email, Instagram can be a powerful tool to grow your invitation business. It’s the fastest growing social media platform and is a huge influencer for consumer decisions and purchases. Not surprisingly, nearly 60 percent of all 18- to 29-year olds and 30 percent of 30 to 49 year olds use in the US use Instragram. 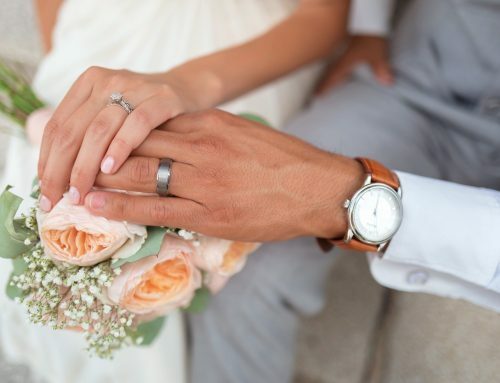 What this means for your business is that you can target people who are looking for invitations and inspiration for their Bar or Bat Mitzvah, Sweet Sixteen, baby shower, wedding, and beyond! And yes, teens are literally creating Instagram-themed Bar Mitzvah parties. But what makes Instagram stand out from the other social media platforms? According to a recent study, there are 58 times more chances for Instagram users to comment, like, and share a post of a brand than users on Facebook and 120 times more than Twitter users. All such data indicates that users are going to move from Facebook and Twitter and turning their move to Instagram. It proves that Instagram is the leading mobile and social platform for brands in order to reach audiences which want to engage. And it makes sense; Instagram offers a platform for curated glimpses into lives and brands. This level of personalization creates a better, more contextual mobile experience that leads to purchases – and people naturally trust recommendations from people they align themselves with more than brands. 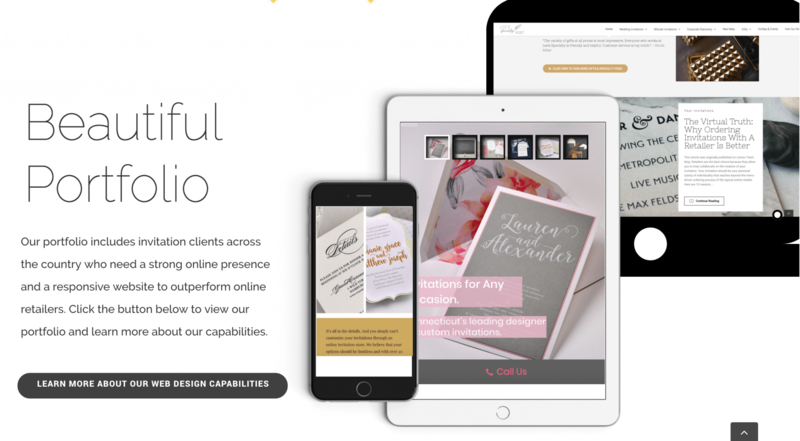 For your invitation business, You should use it as a tool to showcase your products, behind-the-scenes work, and expertise. Then, you can direct viewers to your site. Read below to learn five tips to grow your invitation audience. 1. Post interesting and inspiring content. This is the content we posted when we had little growth. This is what we post now. Notice a difference? Before, we only posted photos of invitations. After a while, we realized that it was very redundant. No one wants to see the same content posted over and over. As a result, our page growth was stagnant. We decided to incorporate more graphics with sweet sentiments along with beautiful wedding and Mitzvah photos that coordinated with the invitation theme. 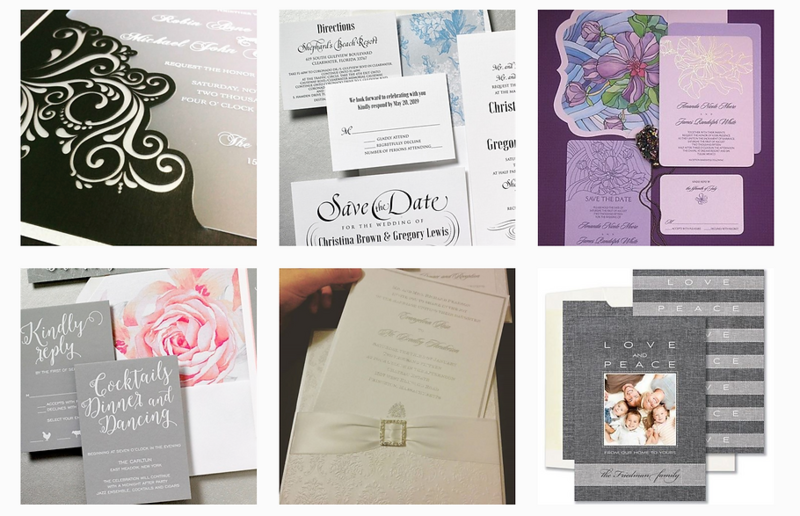 Not only does it show off the invitation, it also gives the viewer theme ideas for their wedding, Mitzvah, or other event, and brings the invitation to life. After all, invitations are only one piece of the pie. There is a broader spectrum to utilize for creativity in posts. You can look at the Lemon Tree Instagram page for more inspiration and ideas. And don’t be afraid to ask your clients to post photos from their big day! You can tag them to give you more visibility and show off to their followers. It will also humanize your business and make it look more authentic. You can also utilize the Instagram story feature to show “behind the scenes” of your business. It’s a great way to share content between your actual posts. And yes, people often misspell stationery, so we include #stationary so as not to exclude anyone. 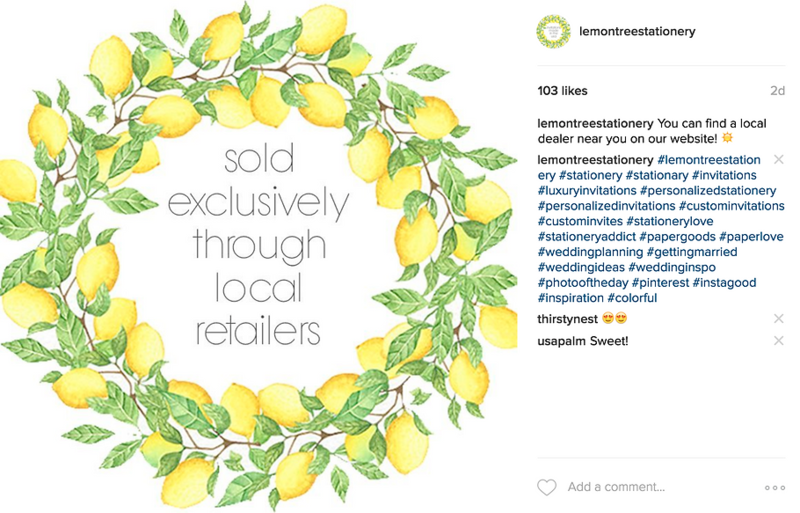 At Lemon Tree, we don’t focus on location hashtags because we want to attract viewers from all over the US. This way, we will have viewers from all over that will visit our site and find a dealer located near them. Also, you don’t need to post your hashtags with your caption. This looks cluttered and outdated. Hashtags are necessary, but it doesn’t mean anyone likes to see them! Post your caption first. Then, comment your hashtags. It hides the hashtags from viewers on a mobile device. See the photo below for clarification. I can’t emphasize this enough. This is the most important tip and element for growth. So many companies think that their page will grow if they post often. This is just not the case. While some followers will find you through your posts and hashtags, YOU have to also make an effort to go out and find followers. 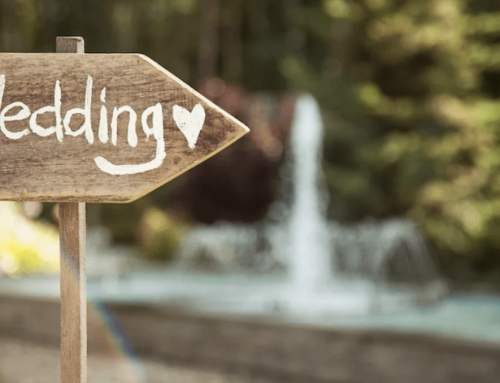 A good and easy way to do this is to get on Instagram from a desktop and search relevant hashtags (#weddinginspiration, #weddingday, #barmitzvah, #mitzvahparty). Spend some time liking, commenting, and following people that are using these hashtags. A quick way to comment on photos is to use an emoji. An emoji is a visual representation of an emotion, object, or symbol. Emoji are in modern communication apps such as your smartphone’s text messaging or social networking apps such as Facebook, Instagram, Twitter, and Snapchat. To access your library of emoticons in any app, tap the smiley face icon on the keyboard. Everyone loves the “?” emoji and it is a quick way to convey that you love an image that was posted. Don’t shy away from emojis! Just don’t go overboard. 4. 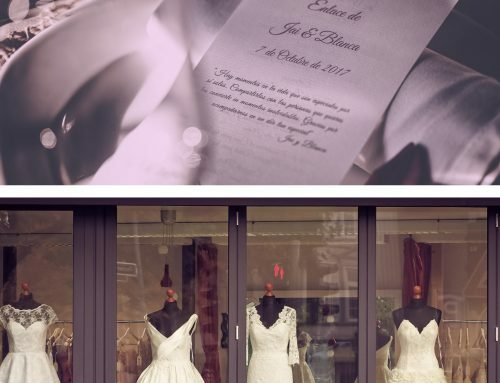 Find a local wedding vendor and cross-promote each other. Not only will this give you new content, it will also help get your business in front of more eyes. Which could mean more followers and people looking at your business. 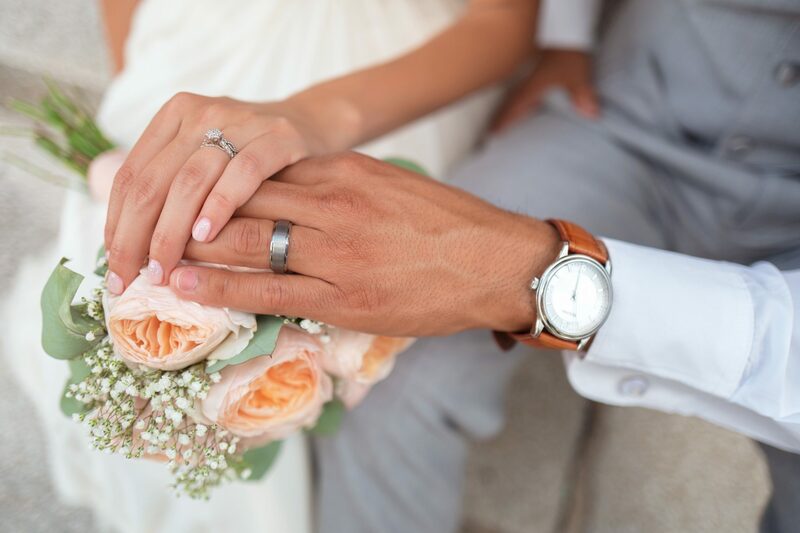 Ask a florist, photographer, venue, or even a caterer to see if they are interested. Perhaps you already refer each other to customers. At worst, they say no. Move on and find someone who sees the mutual benefit. Don’t be afraid to promote yourself. 5. Make an interesting Instagram Bio that highlights your invitation store/home business location. This is another instance where you shouldn’t be afraid to use emojis. Just don’t go crazy. They make your profile more colorful and fun to look at. Your Instagram bio should be concise and tell viewers why they should follow your page. Be sure to include your website link. *BONUS* 6. Tag people in your photos. When you tag people in your photos, it shows up on their profile as well. You could simple tag your friends and family or tag other local wedding vendors. You can also tag Lemon Tree! We will repost beautiful images from our dealers. We’re here to promote and help you! I hope you found this article useful to grow your invitation business. If you have any more questions or need help or clarification, don’t hesitate to email me.